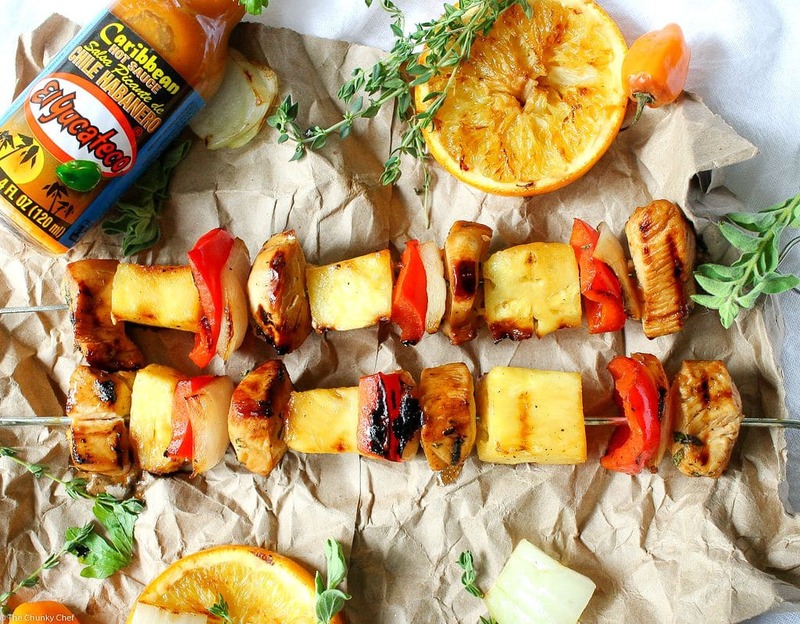 Taste the Caribbean in these citrus habanero chicken skewers… marinated chicken, onions, peppers, and pineapple.. all grilled to smoky charred perfection! 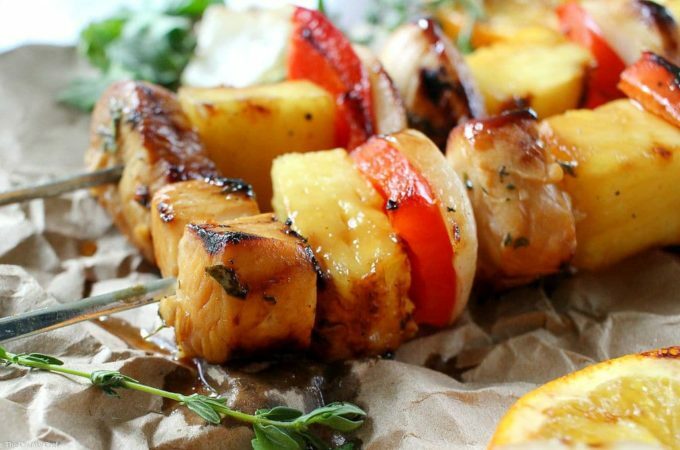 Taste the Caribbean flavors in these citrus habanero chicken skewers… marinated chicken, onions, peppers, and pineapple.. all grilled to smoky charred perfection! This is the type of meal that just practically begs to be grilled. The flavors intensify and that smoky charred flavor works so perfectly here! 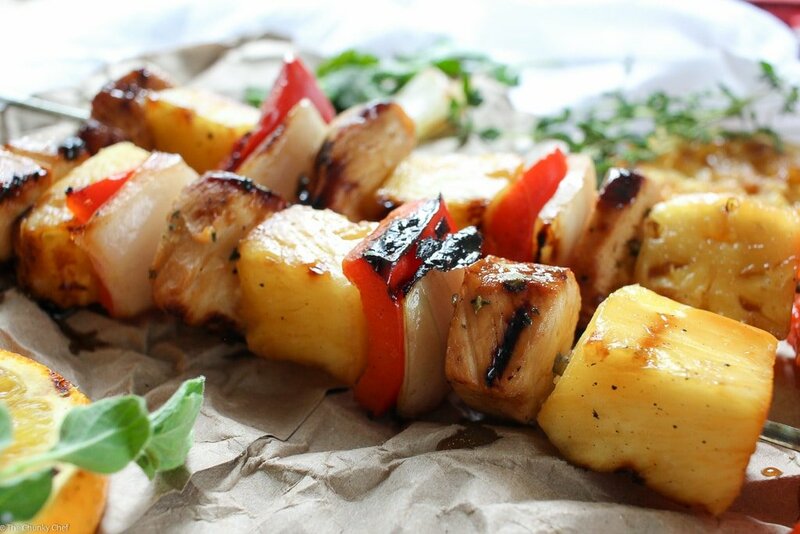 I chose to serve my chicken skewer-style and add some sweet yellow onions, red bell peppers, and pieces of pineapple. They add a nice flavor, as well as a beautiful presentation. If you’d like, you could grill your chicken and fruits/veggies separately. It’s actually a little easier that way, since you don’t have to worry about your veggies/fruit being overdone while you wait for the chicken to cook through. 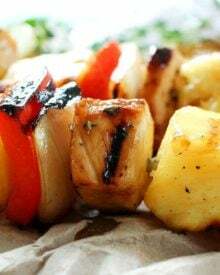 I like to cut my chicken into 1 inch pieces before I marinate them, it makes it a lot easier to get them on the skewers… plus you don’t need to marinate them as long as a whole chicken breast! I wouldn’t go much farther than the 2 hours of marinating time though, because the citrus juice can actually start to toughen your chicken or “cook” it. However, if you left the chicken breasts whole, you could marinate for a longer time. Citrus-y, herb-y, smoky, spicy perfection!! Want to know my secret weapon for these chicken skewers? I think the honey tames the heat down a bit. But if you’re worried about the heat, you could use less than I did, or even add a little coconut milk to the marinade. 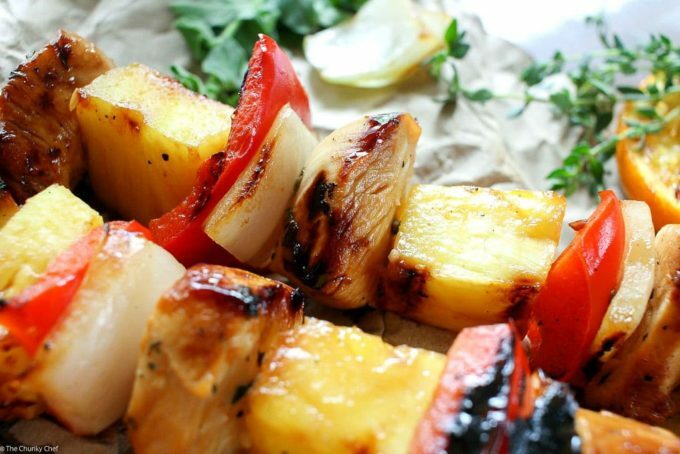 This is one grilling recipe that will “wow” anyone you grill it for! The chicken stays nice and tender/juicy/flavorful by basting it with the marinade as it grills. 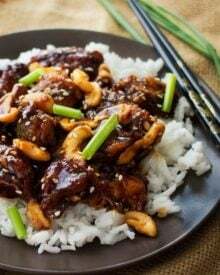 You could serve these bad boys with just about anything, but my personal favorite is this pineapple coconut cashew rice, or these slow cooker roasted mushrooms! If you’re using metal, re-usable skewers, you don’t need any prep for that, just go ahead and slide the ingredients right on the skewer. 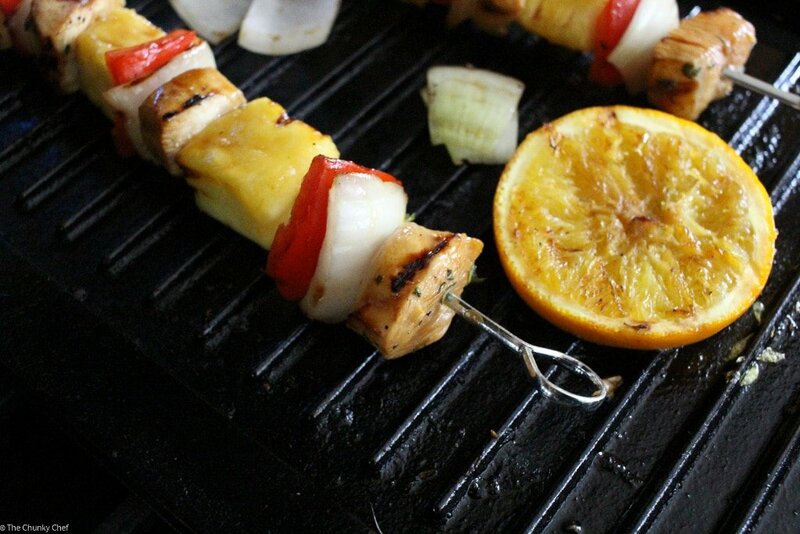 If you’ll be using wooden skewers, soak them in water for 20-30 minutes so they don’t burn on the grill! 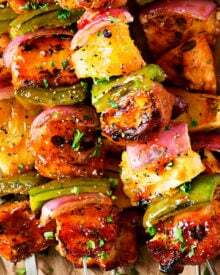 Taste the Caribbean in these citrus habanero chicken skewers... marinated chicken, onions, peppers, and pineapple.. all grilled to smoky charred perfection! 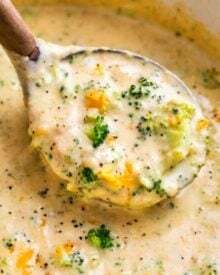 8-9 pieces boneless skinless chicken breasts, diced into 1"
2 pieces yellow or sweet onions diced into 1"
2 pieces red or green bell peppers diced into 1"
In a large mixing bowl, add marinade ingredients and whisk to combine well. Remove about 1/3 cup and place into an airtight container and refrigerate. Set aside the remaining marinade. Trim chicken breasts of fat and dice into 1" pieces. Add to bowl with the marinade and toss to coat. Cover tightly with plastic wrap and place in the refrigerator for 30 minutes, or up to 2 hours. Dice onion, pepper and pineapple into 1" pieces and set aside. Preheat grill over MED heat. 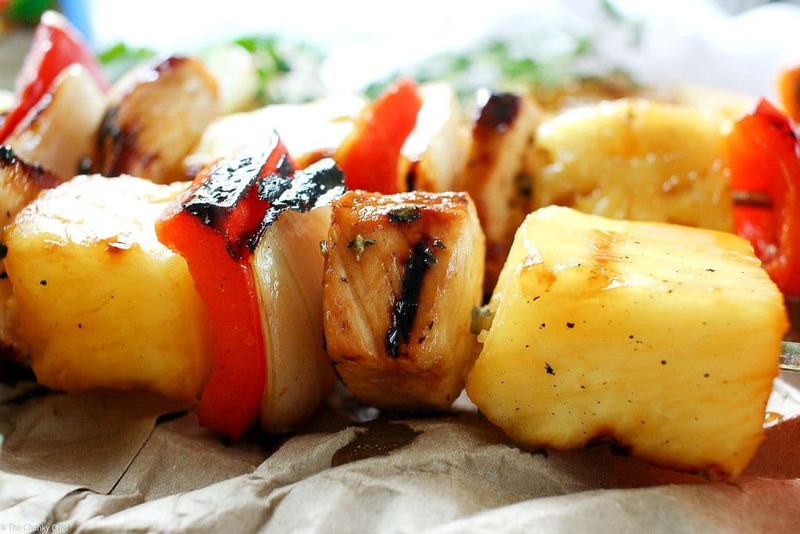 Make skewers by alternating chicken, onion, bell pepper and pineapple. Grill, basting with reserved marinade, for several minutes per side, until chicken is cooked through. ** if you're going to be basting with the marinade that had RAW chicken in it, you need to boil it for 10 minutes before basting with it! Hi there 🙂 I get hundreds and hundreds of spam comments daily, so it’s entirely possible that your first comment got caught up in that and deleted 🙁 Blogging can be an amazing creative outlet… and I’m not sure what type of blog you’re wanting to start… but my advice would be just to go for it 🙂 Everyone starts somewhere and over time, your readership will grow. There are a lot of great blogging platforms out there, but I personally love wordpress. Best of luck to you! These look perfect for a Summer meal! Thank you so much for linking up at Tasty Tuesday! This post has been pinned on the Tasty Tuesday Pinterest board! I love having you and can’t wait to see you next week! Gorgeous pictures, fabulous marinade – looks like a tasty meal! Thanks again for stopping by #TryaBiteTuesday and sharing another delicious recipe! Have a fabulous week – hope to see you again next week! These look delicious! Perfect for summer. Amanda I cannot get over how gorgeous these pictures are!!! Stunning! 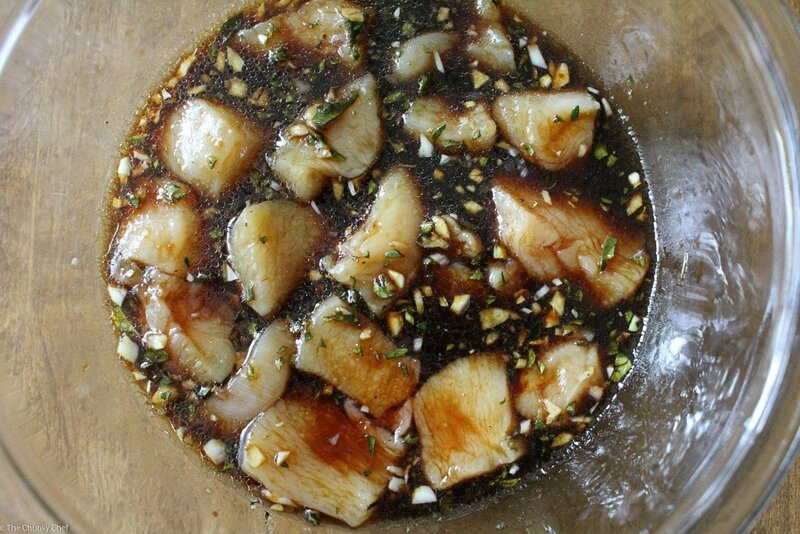 And this marinade does look really fantastic! I think habaneros are unique because they actually taste good… they aren’t just hot. I’m sure the flavor on these babies is fantastic! I love spicy food! Must try this recipe. Soon. This is a great recipe for the grill. I love the flavours and spice you have in it. And thanks for the tip about cooking the marinade to use afterwards – I had never thought of that but it does make perfect sense. These look soooo good! I’m a wimp when it comes to spicy things too, but it’s sooo much better if there’s a lot of flavour too! You had me at habanero!!! 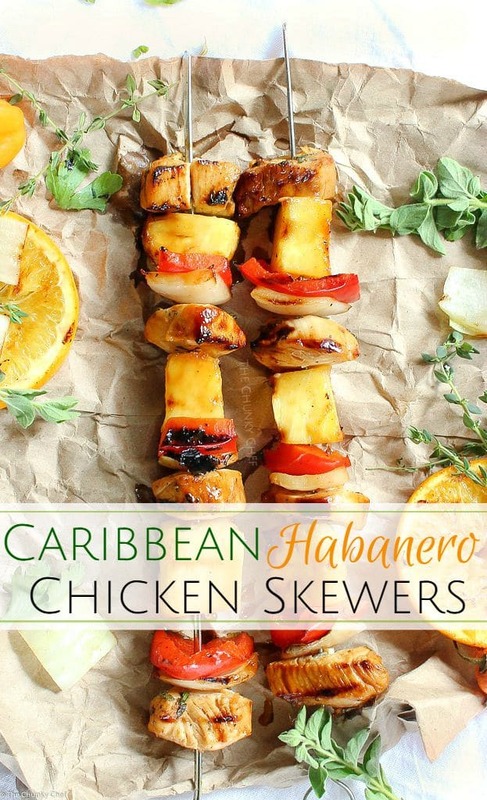 Cannot wait to give these delicious skewers a try!!! Love the kick of flavor in this marinade! Skewers are my favorite grilling food. I’ll be trying this version next! We love spicy in our house! I am going to add this to the menu for our next BBQ. Yum! I actually love spicy food, but definitely not the kind that has no flavor and just tears up your mouth. 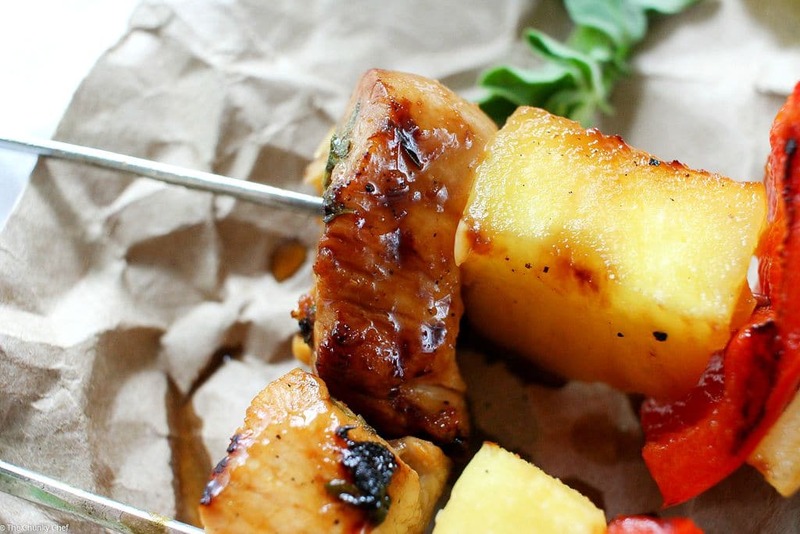 These skewers sound right up my alley! Thanks for sharing! What sweet, spicy, and finger looking good deliciousness! And I love that it’s pretty quick and easy to make! I be this marinade would do well pre-made and frozen for busy nights! Thank you so much Rachel!! Ooooh I bet you’re right… I’ll have to try that the next time we make these. Love meals like that! What a fantastic marinade! It looks and sounds so flavoursome. This looks delicious! I like heat but not like my husband. I like a kick after the flavor.